Sam Brannan arrived in Napa Valley in the late 1850s and purchased a square mile of land at the foot of Mount St. Helena. This is the store he built, in which he made $50,000 in one year. 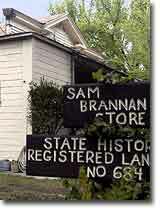 Sam Brannan's store still stands in a quiet Calistoga neighborhood, but we were unable to locate the official commemorative plaque.